Word in that Mozambique Spearfishing Trips are a Big No No at the moment as the xenophobia attacks on Mozambicans by South Africans has spurred attacks on South Africans in Mozambique. Apparently businesses and property ..including cars owned by SA's have been damaged and a couple reports of violence on South Africans ..especially whites!!! So I guess that that will put a hold on a few trips that were planed? Lets just hope that everything gets sorted out soon, I was amping to do another spearfishing trip up to Moz in December. On the weather front the south will only come through tomorrow, its not very strong but it is better than nothing!!! Well the sea is still muck and a bumpy north swell is still running and will probably continue until the week end. Hippo news is that it appears that our hippo has moved back north, this is good news as there are many more quiet spots where the ol chap can get out and feed. There are also acouple lagoons that might look inviting. Iain sent me a pic of his Iggie ..... nice one Spumbu!! Good to see the Salty boys with the 2 largest fish of the comp!! Thats what I am talking about!!! 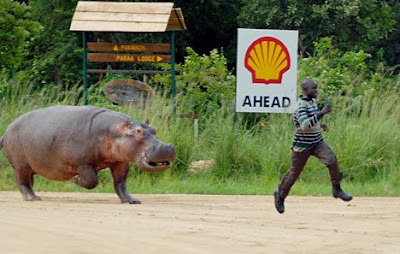 While we are the subject of Hippos, here is a pic of a guy breaking the 100m dash record with 'Huberta' close on his heals. Hippos can reach 48km/h way fast than man. Fast for humans is 40km/h and thats a world record sprinter!! I commented the other day that everything seems upside down. The weather is like it should be in spring, the sards are on vacation somewhere ....or on some middle eastern dinner plate! But imagine what went on in the minds of the guys who stumbled across the hippo yesterday morning at Thompson's Bay!! Picture this it just getting light and you jump into the surf and start to paddle out. You are not really worried about any dangers, the sharks are sorted out with the nets and last time you checked that was about the only thing that was going to eat you. So off you paddle and duck dive a wave smack bang into a Big lump that proceeds to snort and chomp your board in half ...... remember the old 'Chomp' ad?? It then turns to you for main course ......freak!! Who said surfing was not an extreme sport? Jokes aside this Hippo is far from home, worse yet far from any natural habitat. If the Hippo continues south there is no safe refuge for it for 100's of kilometers. Man and Hippo's dont mix well and there are more deaths by Hippo's than any other wild animal in Africa. Unfortunately Hippos are also almost imposable to capture, and being in the sea makes it more than an imposable task. The options are to leave the animal and hope it moves off to were it can exit the water to feed and maybe then they will be able to capture the animal. The other option is to kill the animal, sad as it sounds this might be the only real option. An oficial ranger said to me that he would rather answer questions on why he shot the animal as apposed to answering why they left the animal that killed some one. Sobering but real! I cant imagine a Hippo making that journey now days!! 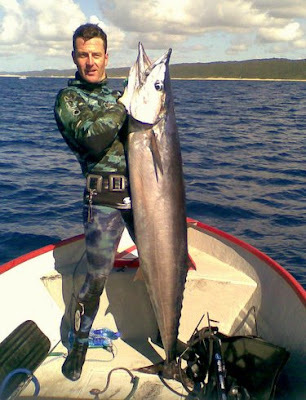 Anyway here is a short clip I put together of our "Huberta"
Andy bust out last week at Spearfishing Nationals with this whopper of a Wahoo, unfortunately they rules they were using at nationals were still set with a max weight of 7 or 8kg. So Andy's fish only got him 7 points ... that same as if he shot a little king fish that was irritating him. I know the rules are such to eliminate luck ..... I suppose you just have to be lucky to get close to a Big Wahoo and lucky to land it? ......... Sorry Andy you were just lucky! Who actually cares? This fish is a bomb fish, Andy said that it was up there with shooting his Marlin, maybe even better. And if you were wondering it did not just swim right up to him. In fact that day the Wahoo were shoaling, and a number of guys got close to the shoal that was said to be over 50 fish. Funny how no one else got lucky?? Nice one Andy ...... you are tops in my book! What on Earth is going on?? Seriously what is going on?? It looks like we are in for another week of east winds caused by a stubborn high pressure system pushing all the low systems south. Everything is out of wack, and we should be getting at least 2-3 days a week of south winds this time of the year. Another very concerning thing is the sardines. The guys based down in the eastern cape who track and film the sards are yet to see any. Usually by this time of the year they are 2 - 3 weeks into chasing the shoals. This year there is nothing, nada zip! There are no birds nothing only a couple pods of 'lost' dolphin. The big question is ....weather or over fishing? I hope something comes right .... I mean even the surf is kuk. What the Freak ... where is the west!! Flip this is ridiculous!! I have been checking all the forecasts and it seems that there are whole bunch of high pressure cells breading over us!! This is causing all the low pressure systems way south of us and that is the reason for all the blinking easterlies!! Its like its a mild version of spring winds going down. .... Its bloody depressing! Spearfishing and fishing can be frustrating this time of the year and for that reason many aren't rushing down to the water. But it is not uncommon for real bus cuta to come out at this time of the year. Connor Birkett and some mates came seriously right with some bus cuta over the weekend. 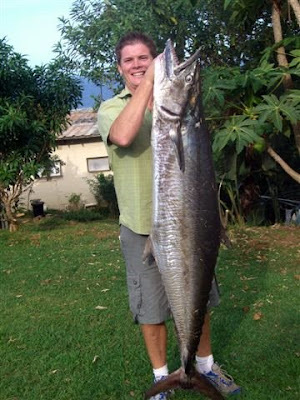 The smallest fish was 13kg, and a bunch of cuta around the 20kg mark came out. The fish that caused the most commotion was Connors 34.8kg monster .... thats probably going to be the fish of the year for the paddle ski chaps!! ... sorry cant say exactly where! News from National Spearfishing Champs is that a couple good fish have come out, Andy Henwood apparently nailed a monster Wahoo .... I will get some pics up as soon as I get them. Bummer first sign of a west is Monday :-( typical!!! Well the east screwed up the sea ... and if you are looking for a dive the bluff might be your only hope. It is probably 3 -4m here so if you are supa desperate ..... well thats up to you. After a great weekend I was greeted this morning with a forcast that shows only east winds all week!! Freak .... bang goes any ideas of diving or surfing! I will bring you up to speed if I hear of any good fish over the weekend. I did see some chap with a garrick tail sticking out the bin of his bukkie driving through town ...so the garrick are around. I was also chatting to a mate down on the lower south coast and he was saying that the Garrick have been slow there. He said that usually he has 2 garrick on most dives by May. But this year he said he has seen very few fish ........ I wonder whats up?? The easterly put a bump on the sea and it looked a little greener, although still diveable. The east is going to blow today but from tomorrow some southerlies will come up, making things promising for the weekend. Nationals start soon and the boys are starting to head up to Sordies to 'climatise' them selves. A whole week of chaszsing fish ..... with enough time and money.... the things I would do!! The sea was not that bad this morning and you would have been able to dive and surf. I opted for the surf as its been ages since I got a wave. I was also blessed with a board and wanted to test it out. Morne and I hopped in at Sunrise and as I came around the point a set pulled in and I got a quality barrel. What a way to start a sesh and for the first wave on the board. Hey if you are in Durban tonite pop into the Wahoo club, they have some fresh footage of the tuna down in the cape ... Mark Sav who has seen it recons it is epic. A solid west has pulled in and I am amping for some surf on Wednesday ... looks promising! A serious amount of buggs went missing this weekend. A hoard of masked gluttons seem to the culprits. ...... Go boys go!! But unfortunately other than the odd snoek and very lonely Garrick very little else came out. Some Dagga have started to pull in and the guys are starting to hear their enticing thumping, drumming away at our frustrations. Damn I love to hate Dagga!! At the moment the sea is still good for a dive, but dont bother looking for surf there is still very little swell. Wednesday morning looks good for some surf. .... maybe see you out there. Its Friday and its also Club Nite tonite .....gonna be a hum mm mm dinger!! The guys have been hammering the buggs ...nice I on the other hand have been stuck at work ..not nice! But other than that ,....... squat! Compulsory briefing and registration will be Friday 20 June at 7 pm at Cape Vidal. All competitors competing in the Wahoo Winter Gamefish Challenge do so at their own risk. The Wahoo Dive Club, its committee, members and sponsors shall not be held responsible for any loss suffered in any way whatsoever. Please pay at the club or in into our bank account. Please use your surname as reference when doing an EFT. 031 705 3816 or email chriswest1@telkomsa.net. Frustrated and off to work! Gee the sea was looking so Lovely this morning, only thing was the tide was too high and the surf was just not happening. The frustrating thing is that its gonna be firing on the low .....when I have to be at work ...... bloody miserable!! The swell will all but disappear over the next few days and the vis is looking mediocre at best ..... somethings going to have to give for some action to go down. And the long term forecast is looking very uneventful. Who knows maybe the sea will magically clean up?? I have just returned from a spearfishing trip in Mozambique, we went up to Barra Point near Tofu. We had epic weather and dived every day until we were spent. The vis conditions were generally very good on the outer reefs but for some reason it was fairly cold around the 25 deg mark .... cold for there! We got some nice fish, but generally it was a scratch for them. Even the local fishing boats were struggling for fish and we had to dive hard for the few fish we did spear. The highlight of the trip was a saily I got off a pinnacle 12km out to sea, but other than that we got a couple cuta and some other nice gamefish, and the Wahoo just eluded us. I did not see any, but the other guys saw them every now and then chilling in the background .... frustrated the living daylights out of every one!! but you will have to wait for the dvd to check it out.